So many of us are busy and don’t really have the time to spend a lot of time in the kitchen. We want to make sure we feed our family a healthy meal though, so what do we do? This quinoa and sausage stuffed zucchini meal will not take you a lot of time in the kitchen and will please every family member. As a Mom, I like knowing my family is getting a good source of vegetables and protein in every mouthful. This dish will give you that. Quinoa is a great source of protein and many healthy vitamins. I remember many years ago seeing this grain at a health food store and wondering what to do with it. My daughter was a vegetarian and I was concerned about her protein intake, so I decided to give it a try. The only thing I knew to do with it was to cook it and add a little butter and salt and pepper. We loved it’s nutty flavor and enjoyed finding other recipes we could add it to. 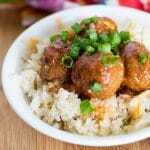 I have substituted it for rice in a few of our favorite dishes. My daughter, who now lives on her own, will cook up a big pot and add vegetables and tofu to the quinoa for a one pot dish. 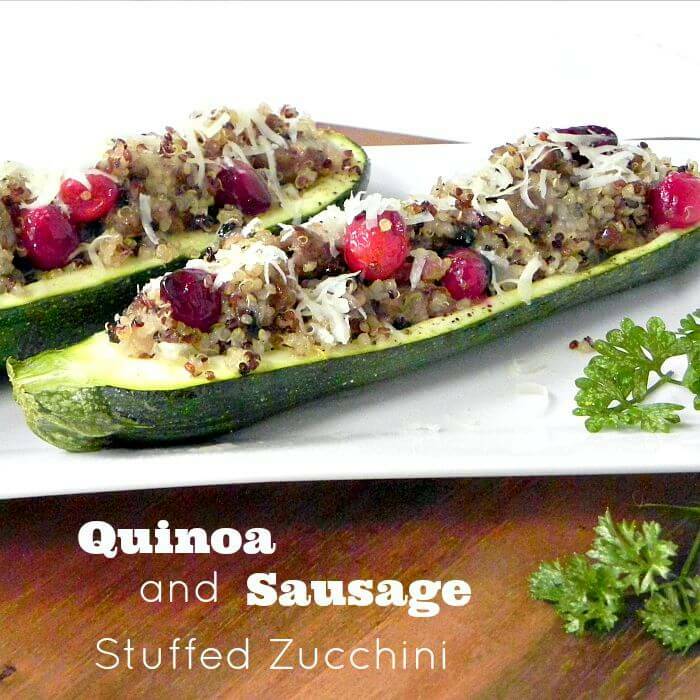 Quinoa and Sausage Stuffed Zucchini is a quick and easy dinner your family will love. Full of protein and goodness. Make some for dinner tonight. 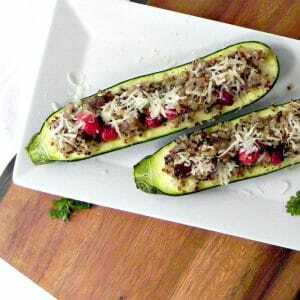 Cut zucchini in half lengthwise. Scrape seeds and flesh from the inside of the zucchini, leaving about 1/4 inch flesh next to the skin. Place the pulp in a bowl. With a sharp knife, cut a thin slice from the bottom of each half so squash sits flat. Brush the inside of the squash with butter. 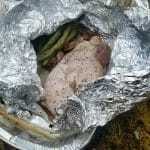 Place on a foil covered cookie sheet and cover with another sheet of foil. Bake at 350 for 15 minutes or until squash is tender. Cook quinoa according to directions. Set aside when done. Meanwhile, in a large skillet, cook the sausage, breaking it up as you go. Remove from pan when cooked. Saute celery, onion and mushroom in oil in the pan you used for the sausage, until tender. Stir in cranberries and cook until cranberries pop. 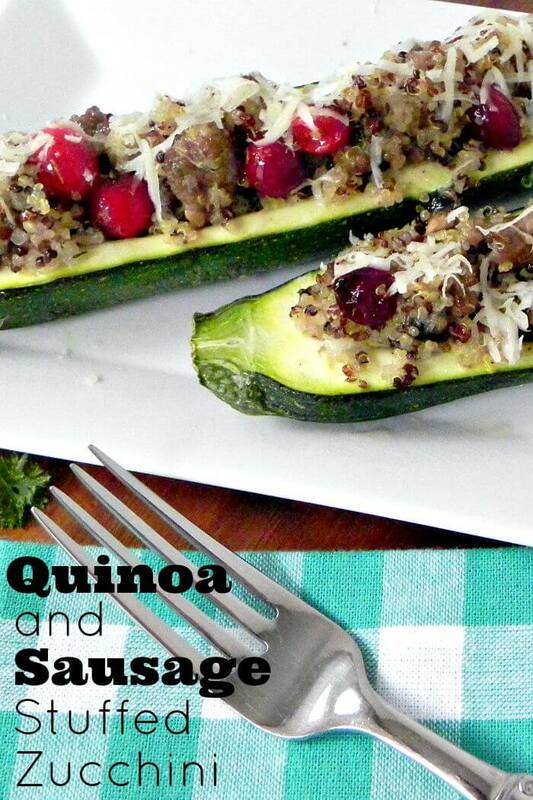 Add the quinoa to the sausage mixture and mix well. Add the sage, thyme and salt and pepper. Add the zucchini pulp and stir well. Stuff the squash and place back in the oven for 5 - 10 minutes. Sprinkle with Parmesan cheese (if desired. After stuffing the zucchini nice and full, I had some of the mixture left over. I put it in a container and heated it up for lunch the next day. It was delicious without the zucchini. 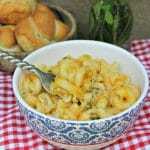 I hope this recipe helps you put a great tasting, healthy recipe on the table for your family. I am sure they will love it. 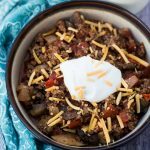 I believe in creating fantastic meals on a budget.To me budgeting doesn't have to mean eating beans and rice for every meal.I love to scour recipe books for great recipes and then remake them to fit in my $5.00 dinner guidelines.